I have to admit, the Danish language is a struggle for me. By struggle, I mean absolutely impossible, no chance of learning more than "I would like to have a big latte" (Jeg vil gerne have en stor latte), "Excuse me/I'm sorry/move" (Unskilde), and "In America, I come from Texas" (I USA, kommer jeg fra Texas). Maybe pathetic, but when "dd" makes a -th sound, letters like æ, ø, å exist and it's totally normal to spell the words with strings of consonants, I'm putting forth a strong effort. W&L requires me to take a Danish language and culture class while I am here. While Danish is the source of many lingual frustrations, I am really liking the cultural part of the class. We read stories by Hans Christian (H.C., or otch-seh) Anderson, listen to popular Danish bands, and occasionally go on field trips. 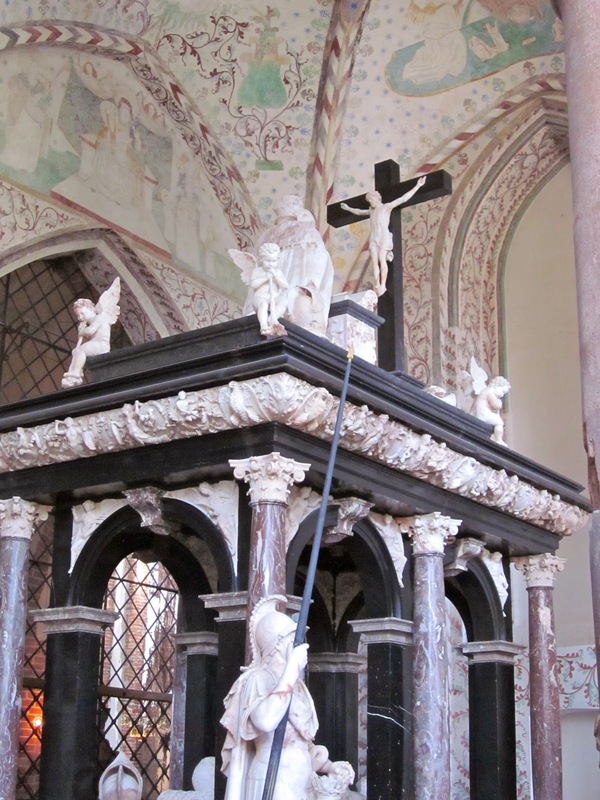 One of our most recent trips was to Roskilde Domkirke, a UNESCO World Heritage Site in Roskilde, Denmark. Constructed in the 12th and 13th centuries, the Cathedral is the first Gothic style building made of brick. It has served many purposes throughout the years, and is still a working church. 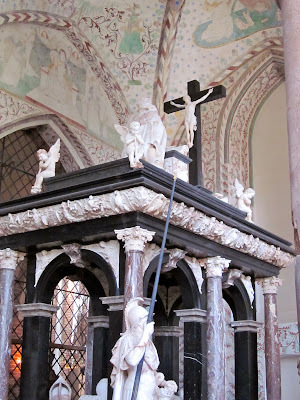 More importantly, though, Roskilde has been the burial place for Denmark's kings and queens (konger og dronninger) since the 1460s, when Christian I was buried there. The iconostasis, or altar screen, used in Medieval times so peasants who could not understand Latin could still see biblical, holy pictures. This iconostasis is carved wood that has been painted. 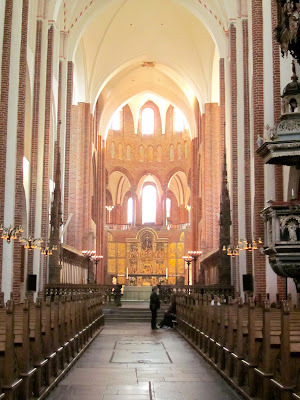 Pictures hardly do Roskilde Domkirke justice. 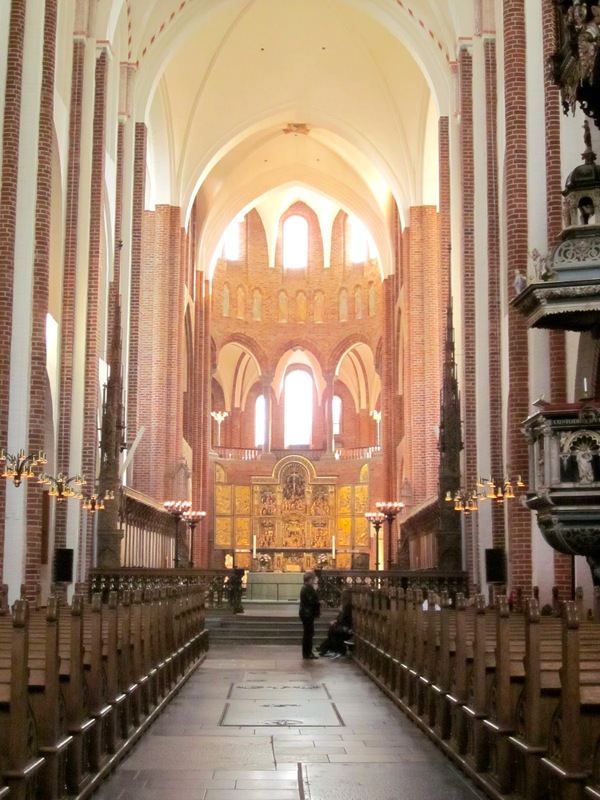 It is a beautiful church, and I completely understand why more than 125,000 people make the trek to Roskilde each year to see it.